DVD Synopsis: Researchers on the undersea laboratory Aquatica have genetically altered the brains of captive sharks to develop a potential cure for Alzheimer’s disease. There is one unexpected side effect. The sharks are getting smarter. Which could mean trouble for the researchers. And lunch for the sharks. 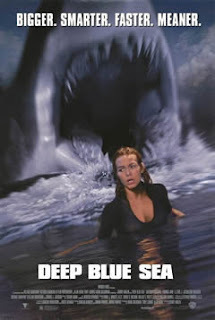 I know the premise of this movie is as basic as they come, and that there isn't a whole lot to it, but even still...the sharks in Deep Blue Sea are kinda amazing. Kept in a tank of their own at a floating research facility, these sharks have been genetically enhanced so that they're five times smarter than any other member of their species (and about 10 times smarter than any character in this film). They can swim backwards, identify the danger of a spear gun before it's even fired, and what's more, they eat other sharks for breakfast! Sure, Deep Blue Sea has a cast of characters (LL Cool J being the most entertaining of the bunch), not to mention a story of some sort concerning a cure for Alzheimer's, but that's not what I wanted to see when I popped this DVD into the player. What I wanted was sharks. What I got was super-sharks, and when they finally broke free, I sat back and enjoyed the carnage. Best ending to the "Hero Speech" ever! And, great twist on the stereotype that the black guy always gets it first! 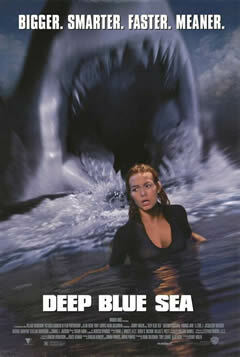 I enjoyed the ending, "A 30 foot shark and you hit me?" David: Thanks so much for stopping by! Yeah, this movie was a lot of fun (and LL Cool J was terrific).